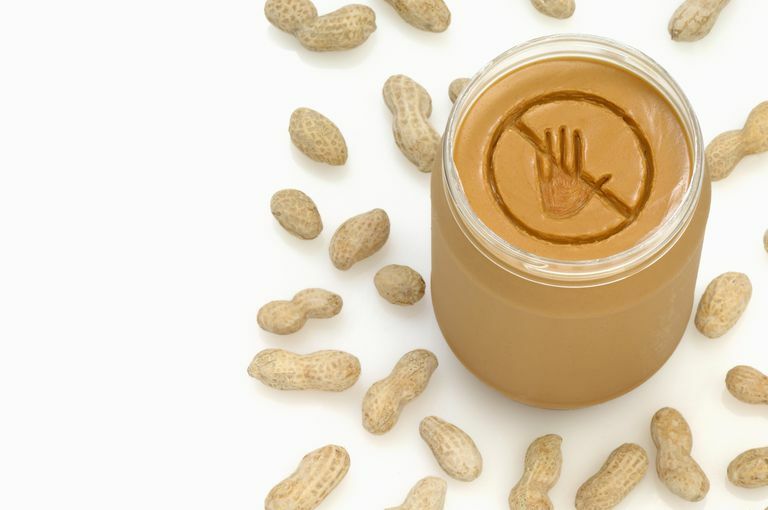 Schools ban peanuts or tree nuts when there are severely allergic children enrolled because those children can react even to tiny traces of peanut or nut dust in the air, or to peanut or nut residue on a surface like a lunch table. In the worst-case scenario, these reactions can be life-threatening. Unfortunately, peanut and tree nut allergies aren't like other allergies. Most people with food allergies—even severe allergies—can manage their allergies by simply not eating foods that contain those allergens. They read labels, don't eat food if they don't trust the food, and they ask questions about potential cross-contamination. Parents of kids with these allergies learn to read food labels to make sure they're safe, but for parents who are new to packing lunches or snacks for a peanut- or nut-free classroom, the learning curve can be steep. Manufacturers in the United States are not required to list the presence of allergenic ingredients on their manufacturing lines, which makes the task even more challenging. Under federal law, peanuts and tree nuts have to be clearly identified in a food label if they're used as an ingredient. Look for the word "peanuts" or a particular type of tree nut—macadamia nuts, brazil nuts, cashews, almonds, walnuts, pecans, pistachios, chestnuts, beechnuts, hazelnuts, pine nuts (pignoli or pinon), gingko nuts or hickory nuts—in the list of ingredients, or following the word "Contains," which appears (often in bold print) immediately below the ingredients statement. Foods that pose a possibility of manufacturing cross-contamination are not allowed in peanut- and nut-free classrooms. Manufacturing cross-contamination can occur when peanuts or nuts are processed on one particular manufacturing line and then another peanut- or nut-free food is made on the same line, where it could potentially have been contaminated. Look for warnings like "may include traces of peanuts" or "manufactured on a shared line with tree nuts." Package notices to the effect of "made in a nut-free facility" indicate safe snacks. Many products, however, include no warnings at all. If you want to pack such a food for your child, check your school's list of recommended snacks (if available), or call the manufacturer to check on the possibility of cross-contamination. Be aware that manufacturing formulations and practices sometimes vary. Even if you've bought a snack before, always look at the label each time you buy it to make sure the ingredients or cross-contamination warnings haven't changed. Sometimes snacks are made in different facilities, some of which may come with warnings while others may not. Make sure you follow school directions. Some schools will require that you send snacks in individual packages, while others may allow you to divide larger packages of approved foods into smaller servings. So what kinds of foods are good to bring to a peanut- or nut-free classroom? It's difficult to recommend specific brands of snacks, with the exception of one dedicated nut-free company (see below), because ingredients and manufacturing practices can and do change without notice. Your school may provide a list of acceptable snacks, though, and one good source for current information will be the parent of the classmate with the nut allergy. Always check labels on packaged foods. Fresh fruit. Bananas are popular year-round, apples and pears are great in the fall, and clementines are easy to peel and available through the winter. There are obviously plenty of other choices. Cheese. Most cheese is nut-free, including kid-friendly string cheese and convenient cheese cubes. Always check the label to be certain the product is safe, though. Vegetables. Baby carrots, cherry tomatoes, broccoli, and cauliflower are among the vegetables some kids will eat raw. Small containers of plain yogurt, salad dressing, or sour cream may be good dips. Raisins and other dried fruits. You may be able to find these in kid-sized packages, but always check the label or contact the manufacturer to be certain they're processed safely. Pudding cups. Again, always check the label to be certain the brand you choose is safe. Air-popped popcorn. Be aware that some popcorn is popped with unsafe oils. Applesauce. The healthiest and most convenient type is unsweetened applesauce in single-serving cups. Fruit snacks. Avoid any brands that also make fruit-and-nut combinations. Potato, tortilla, and multigrain chips. Be certain to check the labels to make sure the manufacturer doesn't use unsafe oils (some do), and to be certain there's no risk of cross-contamination. Lunch meat and sandwich bread. These generally are safe, but always check labels to be sure. Juice, water, soda, and most other beverages. Some cookies, snack cakes, and crackers. These types of snacks are much more likely to contain nuts or to pose cross-contamination risks than other items on this list, so either check labels very carefully or consider buying these items from a nut-free manufacturer such as Enjoy Life Foods (available nationally). It can seem daunting to supply peanut- and nut-free snacks to your child's classroom, since you realize a child's health is involved. Don't be afraid to reach out to the teacher, the school administration, or (if you know the person) to the allergic child's parent to ask any questions and to clear possible snacks. It may seem as though many popular snacks are excluded, but in reality, there are plenty of great kid-friendly foods you can provide for the class. Food Allergy Research & Education. Managing Food Allergy at School fact sheet.